The L.A.T.E. 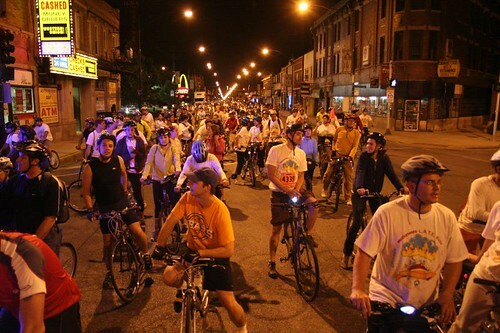 Ride is a massive yearly event, sponsored by McDonald’s, that sends bike riders on a 25-mile loop around northern Chicago, starting at 1:30 in the morning. The path starts at Buckingham Fountain, heads northwest up Elston, and cuts across Foster to the lakefront to turn back south. I didn’t join up for the whole ride, but rode southwards from Rogers Park, back-tracing the route down Foster, then Elston. 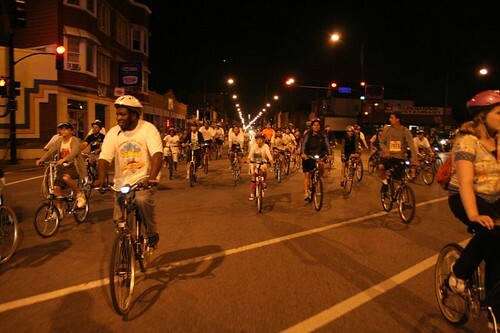 Starting around 2am, scattered groups of bikers started passing me, heading north. First a few… then dozens. Soon packs of a hundred or more were cruising past. 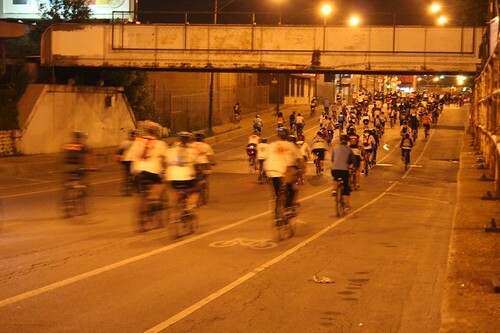 By the time I made it to Ashland and Elston, the road was so thick with bicyclists that it was clearly time to turn around and go with the flow. What unspeakable comradery, to rule the roads on two wheels with hundreds of like-minded cohorts! The ride attracted all types, all ages. Bar patrons waved and cheered us on. Harried policemen and exuberant volunteers ushered us through major intersections. Waiting drivers whooped and hollered. 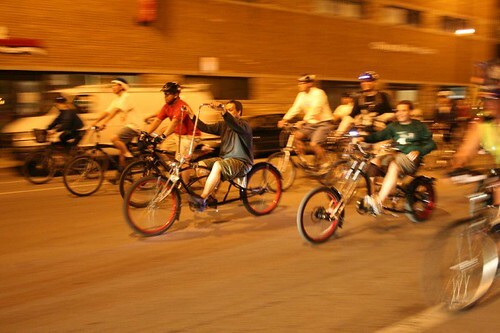 We got high-fives from what looked like a crowd of Naval cadets and from a hippie lady with a huge stereo system mounted on a three-wheeled bike. A half-way resting point at River Park on Foster provided snacks for registered riders. Dawn was beginning to show as we reached the lakefront; stopping for frequent photographs and letting many groups pass me by, I’d fallen almost to the end of the mass. 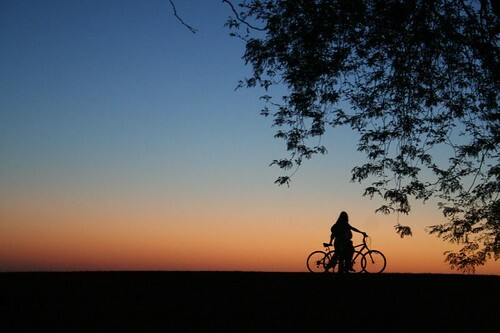 Knowing I had places to be that afternoon, I headed home to get some sleep, as the sun prepared to rise over the lake. I only did about half the ride total, but next year I’m not missing any of it!